Like pretty much everyone I know, I have a massive TBR (To Be Read) pile of books filled with probably awesome literature. Some I’ve started, and for whatever reason never quite returned to. Some I know I’ll have to make myself read one day. And some–often the unexpected ones–I pick up and literally can’t put down. That’s the joy of reading that professional writers can lose track of. We have books we have to read for research, books written by friends, books that we’ve been asked to blurb…”reading for fun” often gets pushed way down the stack. And a lot of these books are fun to read, even if the reading is prompted by one of these ulterior motives. But there’s nothing like being captivated by something you didn’t expect to grab ahold of you so quick, and so tight. 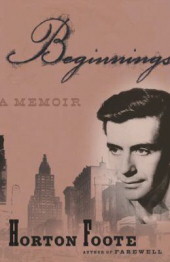 Horton Foote’s second volume of memoirs, Beginnings, did that for me. Foote (1916-2009) was a Pulitzer Prize-winning playwright and a two-time Oscar-winning screenwriter. When Beginnings begins, he’s a 17-year-old just arrived in Pasadena to study acting. Before long he’s in New York, starting to write plays and begin his subsequent momentous career. He name-drops a lot of people you’ve probably heard of, and a few you haven’t, but what’s interesting is that he never presents anything remotely gossipy or aggrandizing about these people. They’re just the folks he met along the way, most of whom treat him kindly. There’s no backstage romance, no backstabbing, and not much back story: the book starts, tells its tale and ends. Heck, he even covers meeting his wife, courting her and their marriage in one paragraph. Simple, sure, but it’s the kind of simplicity that is as rare as spring in Wisconsin. He also uses a lot of dialogue. This might seem odd in a memoir, because truthfully, who remembers that many actual conversations from years ago? Yet because he’s a playwright, and because he doesn’t present anything that sounds remotely “speech-y” or false, it becomes a non-issue. Most of the conversations simply convey information, the way they do in real life. In fact, what makes Beginnings work so well is that Foote’s style is so minimal, and so realistic, that it’s virtually nonexistent. He does an extraordinary job of simply getting out of the way of the story, a lesson more authors (including yours truly) could probably stand to learn. If you’ve seen the 1983 Robert Duvall film Tender Mercies (source of one of those Oscars) you have an idea of what he does, and how well he does it. Beginnings reads most of all like an elaborate “thank you” to the people who helped that young man from Texas make his way in show business. Its Texas-flavored graciousness is part of its considerable charm. I read a fair number of author biographies (most recently Low Road, about Donald Goines), and usually they seem to succeed despite their personalities, not because of them. Foote seems the opposite: he’s decent to everyone, and everyone is decent in return. It may not be entirely true, but I’d like to think it is.